My first Google Glass app is almost ready for public beta testing. 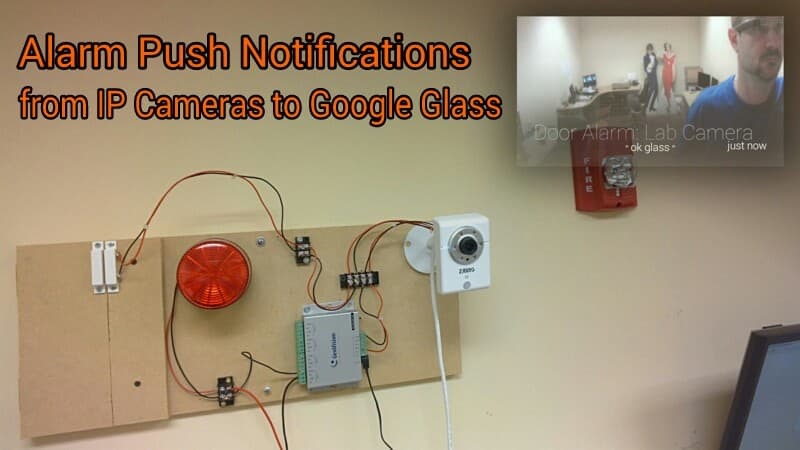 I am integrating Zavio IP cameras with the Google Mirror API so that alarms will trigger a push notification alerts to Google Glass that include a snapshot image of the event that caused the alarm (captured by the IP camera). There is more than one way to implement this and more than one type of action that can be used to trigger the alarm. For this first test, it will work as follows. 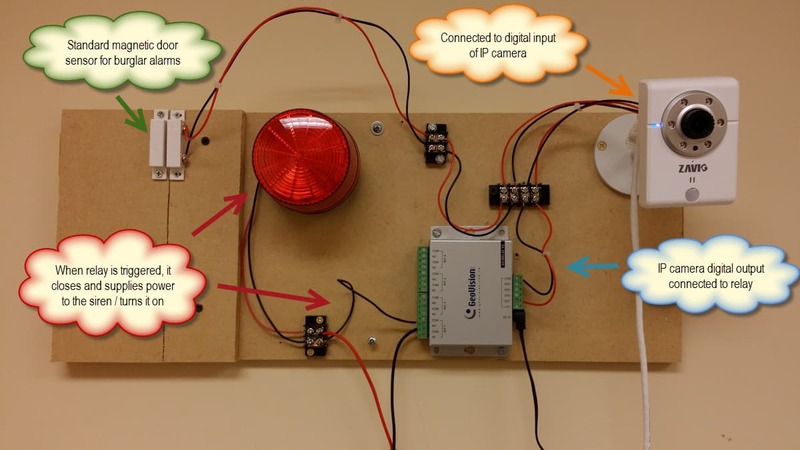 Here is a close up of how the IP camera is wired to the magnetic door sensor, relay, and strobe light / siren. Please click on the image for a larger view. The below images show the setup screens in the camera firmware that define the rules of the digital input and output. 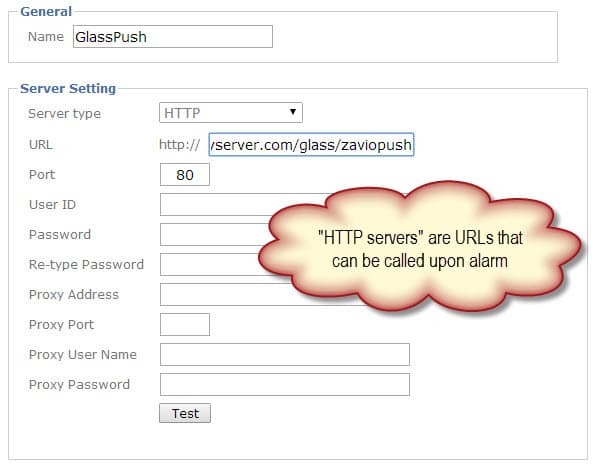 This screen shows how a URL can be configured as an “HTTP server”. This basically means that a URL on the Internet can be called as the result of an alarm being triggered. 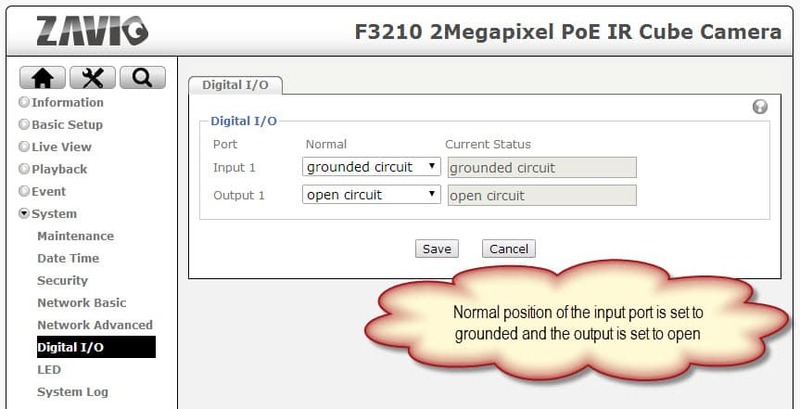 The below screenshot shows the default settings of the digital in and digital output ports. The input port is set to default to be grounded (closed) because the door sensor is closed by default and we want the input to be activated when it is opened. The output port is set to open by default so that when the input triggers it, it closes and provides power to the strobe light. The below screenshot shows the configuration page of the IP camera where the digital input / output rules are defined. An event named “DoorSensor” is defined as follows. 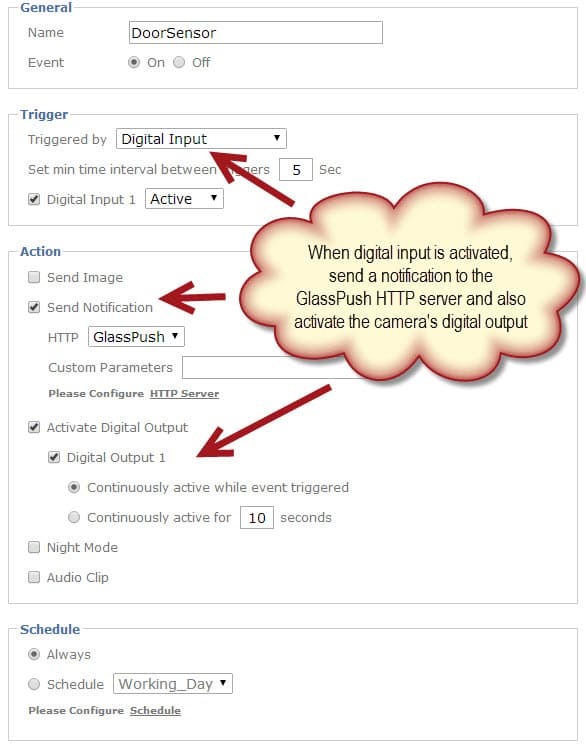 If the digital input is activated (by the door sensor opening), then send a notification to the Google Glass push application and activate the digital output. The digital output is connected to a relay which triggeres the strobe light to turn on. Please note: I could have also set this up without the use of the relay and strobe light. Those actions have nothing to do with the snapshot and message send to Glass. This video gives an overview of the project and also shows the view from Mike’s perspective through Google Glass. A few more things need to be worked out and this application will be ready for public beta testing. If you are a Google Glass explorer and want to test this application, please follow +Mike Haldas or +CCTV Camera Pros on Google plus. Mike will be posting updates about this project on this blog and on those Google Plus pages. 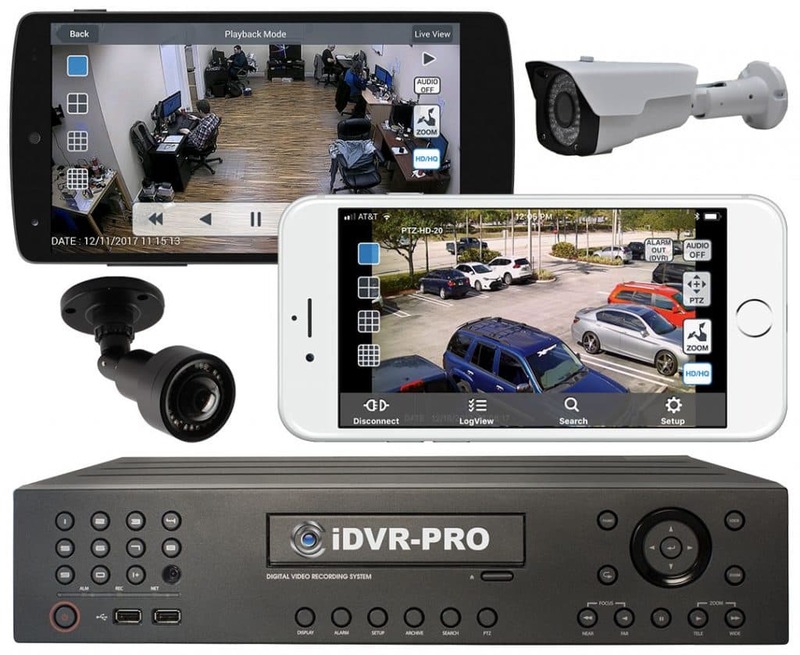 You WILL NOT need your own IP camera to test this application. 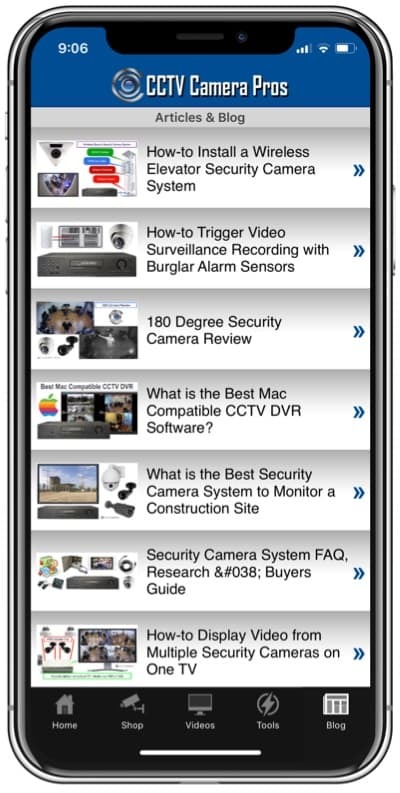 We can give you access to a demo camera when the beta test is ready.